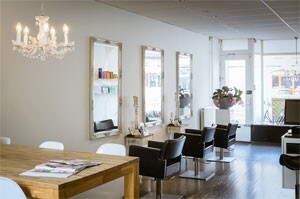 Hairsalon Kappers Inc is situated on a unique spot in the North of Rotterdam (Hillegersberg). It is in this salon where we started, 10 years ago, with our passion for making amazing haircuts and colours. Now, 10 years later, our salon is known for its relaxed ambiance and professional hairstylists that create great hairdo based on your 'lifestyle'. Kappers Inc. is your salon in Rotterdam when it comes to high quality haircuts, hair fashion and the best hair colouring in the city of Rotterdam. Our stylists all have a minimum number of years experiance as a all-round hairdressor and colour specialist. Furthermore we offer a wide range of hair treatments for him and her. So, when you are looking for any specific type of hair style or treatment, our hairsalon in Rotterdam is the place to go for a high quality hairdo. We welcome a lot of highly educated woman and men in our salon. The demands that are asked of these professionals, also relate to appearances. As professional hair stylists we have to take into consideration that our customers do not always have a lot of time and often need a quick hair-fix before an important meeting. Therefore we expanded our daily working hours until 21:00 in the evening.